Set of 6 3-1/4" Tees , Ball Marker, and Divot Tool. Great for your next golf event! 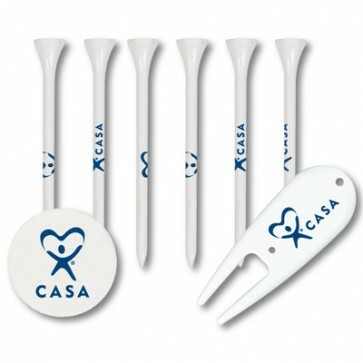 Customized: These items are all customized with the one-color (blue) CASA logo shown in the photo. CASA logo imprint included, please indicate on comments section of shopping cart if you want the GAL logo.